"Wait, wait—look!" I exclaimed to my husband, Terry, on our morning walk. "Where did that come from?" There, before our eyes was a flower, purple and pink with long soft petals. After a particularly long, cold winter, the flower was a miraculous reminder of spring! But there was something else even more amazing than the first spring flower emerging after winter. This extraordinary, colorful flower had pushed through the least likely place—a dirty, ragged crack to the side of the cement sidewalk. 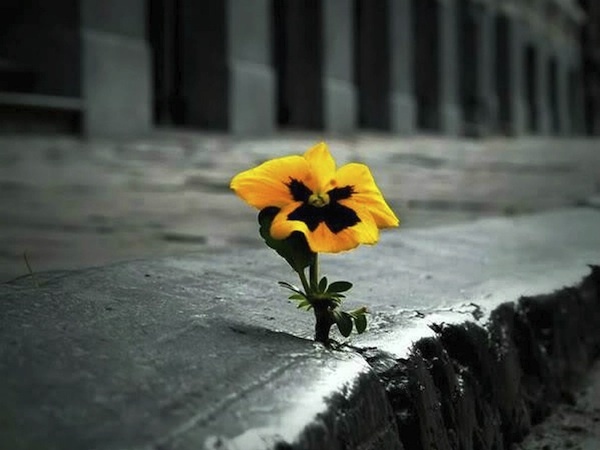 Snug and secure out of the flow of foot traffic, it looked as though this tiny flower had been placed there by a loving hand, for a reason—to simply grow and blossom, despite all odds. Terry scratched his head and remarked, "God at work!" That spring morning, I became suddenly aware of God at work—His ways of working behind the scenes. I was reminded of His Word that establishes Him as our Creator, "the Creator of the ends of the earth" (Is. 40:28); "the Lord, who made heaven and earth" (Ps. 121:1-2); "the Lord, the God of all flesh" (Jer. 32:27). It was on that spring morning, while looking at the tiny miracle flower growing through the crack of cement that I shuddered to think that if we are not sensitive to God at work, we might miss what He is doing! For instance, we might miss God at work mending a marriage because we can't see His instant results. We might miss God at work healing a parent and teen relationship because our impatience might corrode His timing. We might miss God at work blessing our finances because we can't see or get beyond our current debts. If we are not careful, we might end up bitterly stuck—seeing life through the failures and limitations of yesterday—when God is quietly at work attempting to get us to move on to the victories that await us tomorrow. If you know that God has called you to a great future, but you feel stuck in a mediocre or discouraging present, be of good cheer. God the Creator is working things out, whether you can see it or not. His Word calls you to walk by faith, not by sight (see 2 Cor. 5:7), and His Word even tells you to look not at the seen, but the unseen (see 2 Cor. 4:18). God never calls perfect people—only obedient ones. He calls people, plants seeds of His plans and purposes for them, then He gives them opportunities to blossom and to do great things (see Heb. 11, "the faith chapter"). The next time you wonder if God is at work in your life, remember the tiny miracle flower that was discovered growing beautifully in the least likely place. Read Matthew 6:28-30 and remember what Jesus said about the lilies and the grass of the field—and how much more your heavenly Father loves and cares for you and is at work in your life, even this very second, growing miracles that are destined to blossom.